Hi! 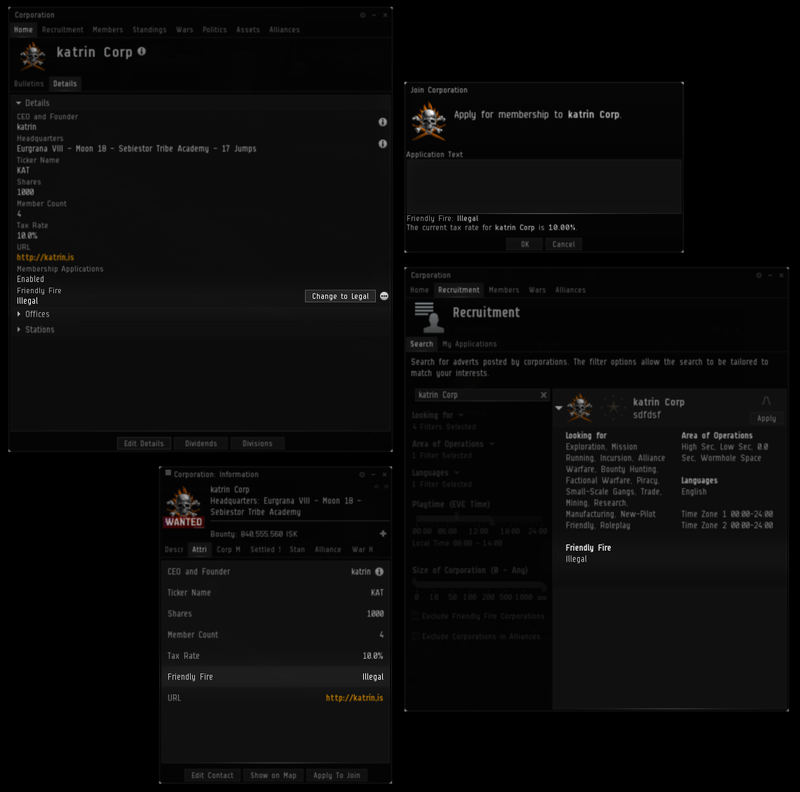 I’m CCP Punkturis and on behalf of Team Five 0 I want to tell you about some of the changes related to corporations that we’ve been working on for Tiamat, which will be released on February 17, 2015! We know the effort and time that CEOs and directors spend on managing their corporations is very valuable, and we want to make things easier for them. That’s why we went to the forums and asked for your "corp little things". A lot of good ideas surfaced and we tried to prioritize targeting them and hope you’ll like the things we’re bringing you this time. We also have further changes that are in-development aimed at improving the corporation UI. These are planned for later release, so keep an eye out for more information on those in the future and read through to the end for a sneak hint of a work-in-progress! We are going to give player corporations the ability to configure whether “friendly fire” within the corporation is considered legal, or if it will carry criminal penalties (specifically CONCORD punishment in high-sec , security status hits, Suspect/Criminal flagging etc). Duels, kill-rights, outlaw flagging and similar situational events will always provide a way to legally attack corp-mates, and will override the friendly fire setting. The safety system will respect the current crimewatch rules and allow/prevent module activation as expected in any given situation. In null-sec and wormhole space, everyone is always a valid target, so nothing will change here. With hangar access permissions, you can make choices about how much you wish to expose your corp to the risk of theft. As your confidence and trust in your members grows, so you can give them more access to assets. Conversely, as a would-be corp-thief, you have the challenge of manipulating your way in to a position where you can clear out the vaults. However with aggression rules, there is no such spectrum of decisions. The only ‘choice’ is the binary option of either joining a corp where other players can shoot you, or simply not joining a corp with others at all. 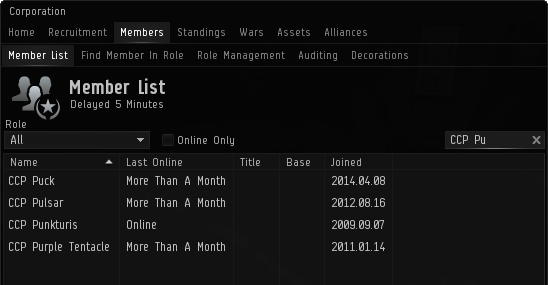 For many players, their optimal choice is therefore to avoid signing up to a corp altogether, and so they inevitably miss out on many of the meaningful social interactions that make EVE unique. Similarly, as a player interested in running a corp for others, you have no ability to choose the level of aggression-related risk that you want for your members. Again the optimal ‘choice’ for some becomes running a corp containing only alts, or just staying in an NPC corp.
We want to add an intermediate choice to these options. One that allows a player to find a corporation where being a member doesn’t require automatically enabling others to legally attack him, but where he can still enjoy the social dynamics that come from being part of a group. It also allows corporations to recruit newer ‘riskier’ characters in to the group whilst still having some degree of control over what they can and cannot legally do to other members. Initially we were planning to simply remove the exception allowing friendly fire in player corps and make them observe the same rule as NPC corps, without any optional setting (as discussed in the CSM 9 summer summit page 77). After concerns were raised from the summit about the impact of this proposal (such as eliminating the free-for-all events within groups like RvB), we postponed implementing it to allow further consideration. This resulted in a revised design giving the individual corps the choice to enable the setting as they see fit. The friendly fire setting can be configured by the CEO or a director from the corporation management window in the same way you configure tax levels and such. The change will require 24 hours to become active, after which it will apply to all corp members. All members will be sent notifications at the start and completion of this timer, which will explain the change and include the name of the responsible character. When friendly fire is set to legal, aggression between two corp-mates will behave exactly as it does now in a player corp. When set to Illegal, aggressive acts will follow the same rules as they currently do in NPC corporations: attacks will invoke CONCORD (in high sec), trigger a security status penalty and also a Criminal/Suspect flag. You are still able to take advantage of limited engagements, kill-rights, outlaw flags and so on to aggress corp-mates if the situation arises – these override the friendly fire rules. The friendly fire status of a corporation is always publicly visible to all players. It will be displayed in the various places such as the corp’s “Show-Info” window as well as in adverts shown in the Corporation Finder. 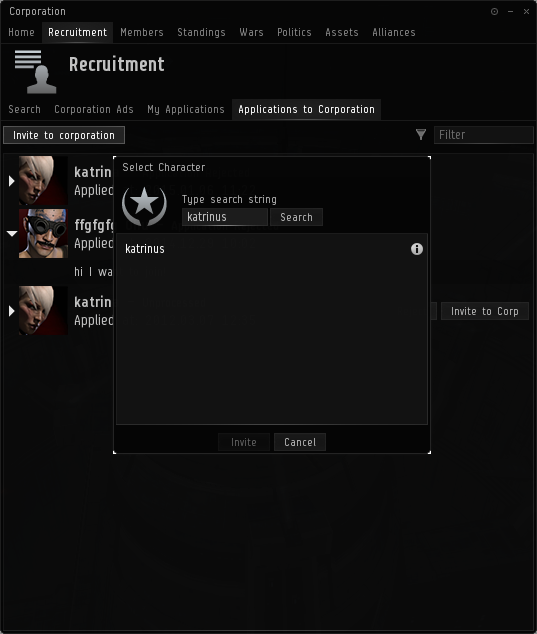 If you’re searching for your next corp, you’ll be able to set a filter to only show corps where friendly fire is disabled. When creating a new corporation, you will choose how you want to set the initial friendly fire state (but of course you’ll be free to change it again later, subject to the 24 hour delay). Existing player corporations will default to friendly fire being Legal – so they will behave exactly the same as they currently do with no action required. It will be up to the CEO/directors to transition to making it Illegal if they wish to do so. Your communities keep getting bigger and more popular, with groups such as Spectre Fleet and RvB Ganked getting close to the maximum mailing list size. To enable them to keep growing, we’ve upped the limit on mailing list membership from 3000 people to 5000. When you have a corporation with a few thousand members we get that it’s near impossible to find a specific member. That’s why we’ve added a filter to the member list. 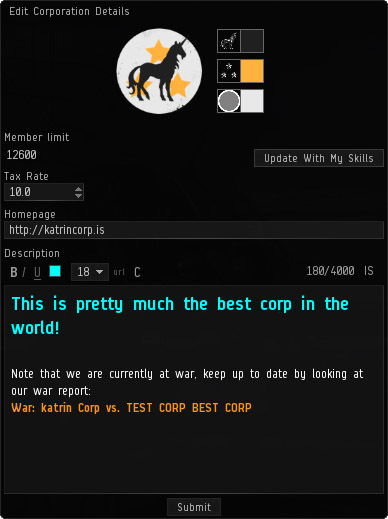 You can now resize the corp details window and make a better description of you corp with customizable font and links and what not. The option to unrent an office is currently in a rather too-well hidden spot. When viewing your list of offices, a button will be displayed for each office giving an easy way to unrent it. Don’t worry about accidently clicking it though, it does check for confirmation first! 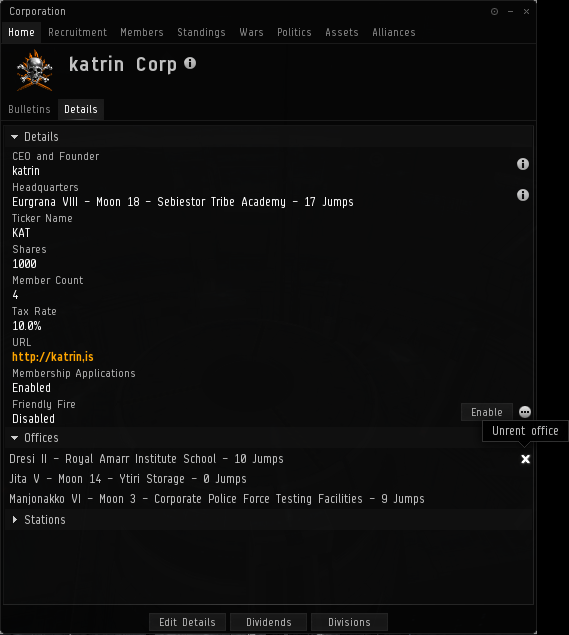 Wouldn’t it make sense to be able to find a character and send him an invitation to join your corp directly from the corp window? Yes we thought so too, that’s why we added a button in the applications tab to search for a character and then send them an invitation. 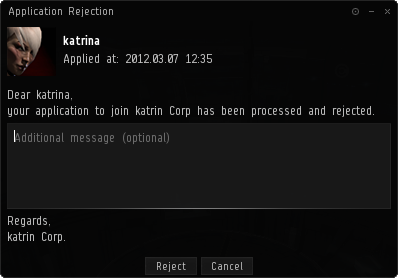 Finding a character after you’ve rejected his application to send him an EVE mail with the reason why is not the greatest usability experience for our beloved players. That’s why we added an option to send a custom message with the corp rejection mail, and of course we know that you will only be sending those people love letters and kind words. Because we know that you’re going to ask us about roles, and why we’re not fixing them, we want to let you know we’re working on it! Unfortunately you won’t see any of that work in Tiamat, but we will tell you more about that when we get closer to releasing it.